LOUDON, N.H — The way 2016 has gone for William Byron, there are few firsts that he has left to cross off of his list. 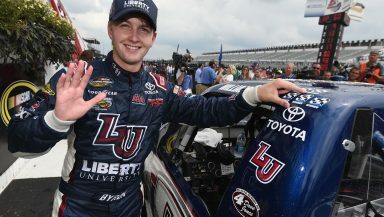 But Saturday, the Kyle Busch Motorsports driver put his Liberty University Toyota Tundra on the pole for the UNOH 175 at New Hampshire Motorspeedway, scoring his first Camping World Truck Series career pole. The rest of the top-12 include Christopher Bell and Tyler Reddick in row two. Row three is held down by non-chasers Ben Rhodes and Brett Moffitt. Former series champion Matt Crafton is joined by Cameron Hayley on the fourth row. In row five it’s Kaz Grala and Johnny Sauter and in row six it is Austin Hill and Ben Kennedy. Two chasers didn’t make the final round of qualifying. Daniel Hemric rolls off 13th and John Hunter Nemechek starts 15th. Nemechek’s struggles started in round one when he was in the middle of his run and Stewart Friesen spun coming off of pit road and caused Nemechek to run an extra cycle of heat through his tires. Hemric was loose throughout his second round qualifying effort.